ONG ago when the oak trees used in building the oldest boat at Brest were but acorns, there lived a poor widow whose name was Ninor. Her father was of noble lineage and had a large fortune. When he died he left a manor house, a farm, a mill, and an oven where all the villagers paid for baking their bread. He left, also, twelve horses and twice as many oxen, twelve cows and ten times that number of sheep, without counting the corn and fine linen. But as she was a widow Ninor's brothers would not let her have her share of the inheritance. Perrik, the eldest, kept the manor, the farm, and the horses. Fanche, the second, took the mill and the cows. The third brother, Riwal, had the oxen, the great oven, and the sheep. So that nothing was left for Ninor but an old ramshackle cottage on the heath where they usually sent sick animals. Alas, that is often the way of the world! When Ninor was moving her bits of furniture to her poor cottage, Fanche pretended to be sorry for her. "I am going to behave to you as a brother and a Christian," said he, "I have an old black cow which I have never been able to fatten and which hardly gives enough milk to feed a new born babe. But you may take her with you. White-thorn can keep her on the heath." White-thorn was the widow's daughter. She was nearly eleven years old and she was so pale that people called her by the name of the white hedge flower. So Ninor went away with her little, pale daughter, pulling the cow along with a bit of rope. And when they reached the cottage Ninor sent them on the heath together. 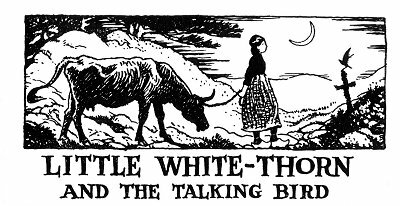 Every day and all the day long White-thorn stayed there looking after Blackie the cow. And poor Blackie had a hard enough time finding a little grass between the stones. White-thorn spent her time making crosses out of broom and daisies while she sang a melancholy air. One day she noticed a bird perched on one of the flowery crosses she had just stuck in the ground. The bird was chirping and shaking its head. He looked at her as if he wanted to speak. The girl was very much surprised. She went nearer to the bird and listened carefully but she could understand nothing. about Blackie. At last the bird flew away, and White-thorn following him with her eyes saw that the stars were twinkling in the sky. Then she looked for Blackie but could not find her. She called, she struck the tufts of broom with her stick, she went down into the hollows where the rain water had formed little pools, but all in vain, Blackie was not to be found. Alack, what could have happened? The child heard her mother's voice calling as if some misfortune had befallen. Frightened she hurried on, and at the entrance to the field, on the path leading to their cottage, she saw the widow kneeling near Blackie. Poor Blackie! The wolves from the forest had gotten her and nothing was left but her bones and horns. White-thorn burst into tears and fell on her knees by her mother. "Oh! Why didn't I know that the wolves were coming!" she sobbed. "I would have made the sign of the cross with my little stick, and they would have fled." The widow at the sight of her daughter's grief tried to comfort her. "Do not weep for Blackie as if she were a human being, my darling," she said. "Even though the wolves and bad Christians are against us, Heaven will have pity on us. Come, help me to pick up some faggots and let us go home." White-thorn did as her mother said, but the tears trickled down her pale, wan cheeks. "Poor Blackie," she said to herself. "She was no trouble to lead about. She ate anything, and she was beginning to get fat." That evening White-thorn would eat no supper and during the night she awoke again and again thinking that she heard Blackie lowing at the door. She got up before daybreak and ran out into the fields barefoot and in her petticoat. As she came near the heath she beheld the same bird that she had seen before perched again on the cross of broom. He was singing and seemed to be calling her. But she understood him no better than she had the day before. She was about to run home when she looked down and saw what she thought was a gold coin lying at her feet. She tried to turn it over with her toe, but it was not a coin. It was the magic herb of gold that you can see only at sunrise if you are barefoot and half-dressed, and at the same time the fairies will bestow on you the gift of sight. Alack-a-day, this happens rarely to poor mortals! Yet so it was with White-thorn. The moment she touched the herb she understood the language of birds. "White-thorn, I want to do you a good turn," the bird was saying. "White-thorn, listen to me." "Who are you?" asked White-thorn, very much astonished that she could understand the bird. I am allowed to make a poor girl rich. This time I have chosen you." "Oh, Robin, Robin," cried White-thorn, "shall I be rich enough to have a shining silver cross with a shining silver chain to go about my neck? And a pair of wooden shoes for my feet as well?" "You shall have a golden cross and silken shoon," answered the bird. "And what must I do to have all that, little bird?" asked White-thorn. "You must follow me wherever I lead you," Robin said. "Oh, yes, indeed," said White-thorn. And so away Robin Redbreast flew and off went Whitethorn after him. She followed him across the fields and through the woods till they came to the dunes just opposite the Seven Isles. There the bird perched upon a blowing bit of bracken. "Can you see anything below on the beach?" asked Robin. "Yes," said White-thorn, "I see a pair of wooden shoes made of beechwood that the fire has never scorched, and a staff of holly-wood that no steel can ever cut." "Put on the wooden shoes, and take the staff," said Robin Redbreast. "I will," said White-thorn, running down to the beach. you reach the first island, then you must go round it till you come to a rock all hidden beneath the water reeds, and the reeds must be the color of the sea." "And then what must I do?" asked the little girl. "You must gather the reeds and make a halter." "That will be easy enough," said White-thorn. "Then you must strike the rock with your holly staff. A cow will come forth. Put the halter on her and bring her home to your mother. It will comfort her for having lost Blackie." White-thorn carried out all the talking bird's instructions. With the magic shoes she walked on the sea to the first island. She went round it till she came to the rock with the sea-green reeds. With these she made a halter, as the bird had directed. Then with her holly staff she struck the rock. Instantly it opened and out of it came a cow just as the bird had said. The cow's skin was as smooth as a maiden's cheek, her eyes soft as the light of dawn. She was very gentle and White-thorn put the halter on her and led her over the water, and then over the fields, and through the woods, and across the heath till they reached the widow's cottage. And when White-thorn's mother, Ninor, saw the cow she was as happy as she had been sad. 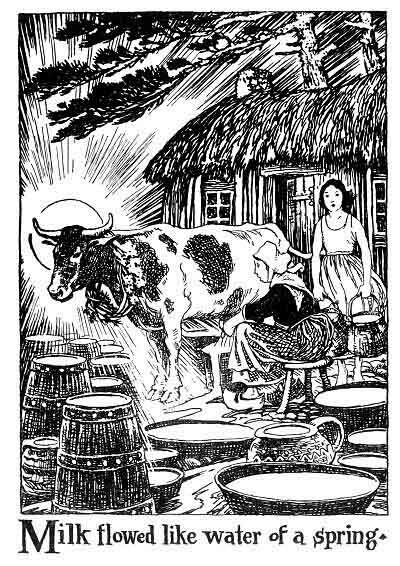 But she was still happier when she milked the cow, for the milk flowed between Ninor's fingers like the water of a spring. Ninor filled all her pots and pans, then she filled her wooden bowls, then her crocks and then her churns, yet still the milk flowed on. It seemed as if beautiful Sea-cow, for that is what the talking bird had named her, had milk for all the babes in Brittany. Soon everyone was gossiping about the widow's cow, and people came from far and near to look upon her. The richest farmers offered to buy Sea-cow and each offered a higher price than the others. At last Perrik came and said to his sister, "If you are a Christian you will remember that I am your brother and you will let me have the first offer. Let me have Sea-cow and in exchange I will give you as many of my cows as it takes men to make a tailor." "Sea-cow is not only worth nine cows," answered the widow Ninor, "she is worth all the cows that are grazing in the highlands and the lowlands. Thanks to her I shall be able to sell milk in all the market places from Dinan to Carhaix." "Very well," said Perrik, "give her to me, sister, and I will give you our father's farm where you were born with all the fields and ploughs and horses belonging to it." tails to prove she had become the owner of all these things, she gave Sea-cow to her brother Perrik. So Perrik led the cow away to a house he had in another quarter of that country. Little White-thorn cried when she saw her dear Sea-cow led away, and she was sad all that day. When night fell she went into the stable to put hay in the mangers for the horses. They seemed to look at her with sympathy. "Alas," she sighed, "why is Sea-cow not here too? When shall I see her again?" "Little Mistress, here I am again." Very much astonished, White-thorn turned quickly and at her very shoulders there stood Sea-cow! "Oh! Sea-cow! Sea-cow!" cried the girl, "who brought you here?" "I do not belong to your wicked Uncle Perrik," said Sea-cow, "because I cannot belong to anyone who is in a state of mortal sin. I came back to be yours as before." "But then," said little White-thorn, "my mother will have to give back the farmhouse, the fields, and the horses." "Not at all," answered Sea-cow, "for they were hers by right, her brother took them from her unjustly when your grandfather died." "But my uncle Perrik will come to look for you here," said White-thorn. "I will tell you what to do," Sea-cow said: "first go and pick three verbena leaves." White-thorn ran off and quickly returned with the three leaves. "Now," said Sea-cow, "rub me with those leaves from my ears to my tail, and whisper softly three times, "Saint Ronan of Hibernia, Saint Ronan of Hibernia, Saint Ronan of Hibernia!" White-thorn did as she was told and, as she whispered for the third time, Sea-cow turned into a beautiful horse. The little girl was wonder-struck. "Now," said the horse, "your Uncle Perrik will not know me. My name is no longer Sea-cow but Sea-horse." When the widow heard what had happened she was delighted. The very next day she hastened to try her fine new horse. She loaded his back with corn to take to market. But you can imagine her surprise when she saw Sea-horse's back growing longer and longer the more she piled on the sacks of corn. So that he alone could carry as many sacks as all the horses in the parish. pigs he was fattening. So the bargain was struck. And Ninor took possession of the mill as she had of the farm, and then her brother led Sea-horse away. The very next evening the horse was home again. And again White-thorn picked three verbena leaves and rubbed him from his ears to his tail repeating the words, "Saint Ronan of Hibernia," three times. No sooner had she done so than the horse changed into a sheep. But instead of white wool he was covered with scarlet wool as long as hemp and as soft as flax. Sea-horse was now Sea-lamb. White-thorn was delighted and called her mother who came into the stable to admire this new miracle. "Go and fetch the shepherd's shears," she said to Whitethorn, "the poor dear beast is weighted down with such a heavy fleece." But when she tried to sheer Sea-lamb the wool grew again as fast as she cut it off. So that this sheep alone was worth all the flocks on the mountains. Now Ninor's third brother, Riwal, happened to be passing by and he saw what was happening. He at once offered to exchange his oxen, his heaths, and all his sheep for Sea-lamb. the rock opened to let her pass, closed again, and she was gone. This time White-thorn waited in vain for her to come home. She neither came back that day nor the next day, nor ever again. So the girl ran off to the hawthorn bush to look for the talking bird, and there he was singing away as before. "I was expecting you, little lady," said the talking bird. "Sea-lamb has gone and will never return. Your wicked uncles are punished as they deserved, and now you are an heiress. You are rich enough to wear a golden cross and silken shoon as I promised you. Now my work is done and I shall fly away. 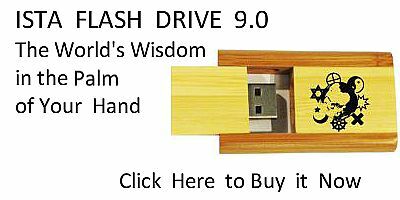 Always remember that you were once poor and that it was a little wild bird that made you rich." And so the talking bird spread his wings and vanished from little White-thorn's ken. But out of gratitude she had a church built on the spot where the bird had perched upon the broom, and she always gave to the poor.